KVS PGT Computer Science Exam Guide: Hello Aspirants, as we all know that the Kendriya Vidyalaya Sangathan is going to conduct written test for 8339 posts of Teaching Staff. Candidates who have recently applied for the post of KVS PGT, now they are started looking for Best and appropriate Books for PGT Computer Science Exam. 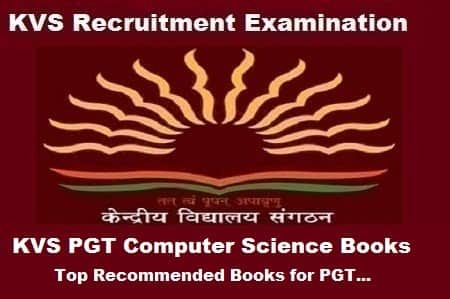 there are many KVS PGT Computer Science Books which are available for the same subject, now choosing an appropriate book according to the KVS Recruitment examination pattern is a very Crucial problem for all the aspirants. so in this article, we will provide you with the detail information about the KVS PGT Computer Science exam Preparation Books. Introduction to Cascading Style Sheet (CSS), three ways of introducing the style sheets to your document. Basic Syntax; Creating and saving cascading style sheets. To download the complete syllabus and concern topics of KVS PGT Computer Science Subject please click on the given link: Click Here. Please help to suggest me only one book for part 1 preparation and name of a good book to prepare computer science recruitment exam 2019 and one for pedological part. In part 1 Both the subject English and Hindi are essential. There are a lot of books available in the market, but I will suggest only one book for each subject. 1. For Hindi: SAMANYA HINDI, (GENERAL HINDI BOOK) by Dr Hardev Bahri: https://amzn.to/2QCojDx (no need to buy any study material or books for Hindi, except this book). 2. For English: Objective General English (R.S. Aggarwal): https://amzn.to/2QCbKYU (This book is enough for English). Is thier Negative Marking for PGT CS? ?